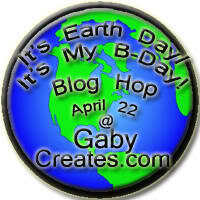 Simply Silhouette: "It's Earth Day, It's My B-Day"
"It's Earth Day, It's My B-Day"
do with a Birthday or Earth Day. (not just honey bees) are in serious decline too. bumblebee species have gone extinct already. Many butterfly species are also struggling. and it's everybody's job to do their bit, however small. Don't BEE worried, I have Blog Candy!! Now... On to see what the Cricut Couple has in store for you. Cute card, you even decorated the inside...very nice. 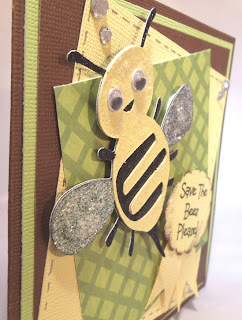 What a great idea for a card......love the bees googly eyes. I'm happy to have found you through hopping! I'm your new follower. Be back soon. What a bee-autiful card and so true! Love that you focused on the bee for Earth Day. How right you are about the importance of pollinators! Bee-utiful card!! (Ha...bet you are getting that a lot!! LOL) I love this Earth Day hop...wonderful projects! love the sentiment.. too cute! OMGsh... HOW BUZZING adorable!! I love the colors you used!! Too cute!!! 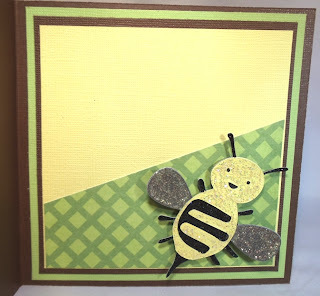 Oh such an adorable bee card!!! Perfect for earth day! I had NO idea the bee population is declining, thanks for bringing awareness! Your card is so cute. I LOVE using bees in my projects! 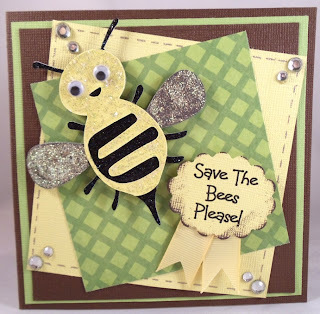 Awesome card and I am with you on helping the bee's!! We need them in everyday life and I am doing my part to help!! TFS!!! very cute bee!!! Love it. I am a new follower. Love your card. Thanks for the opportunity to win! 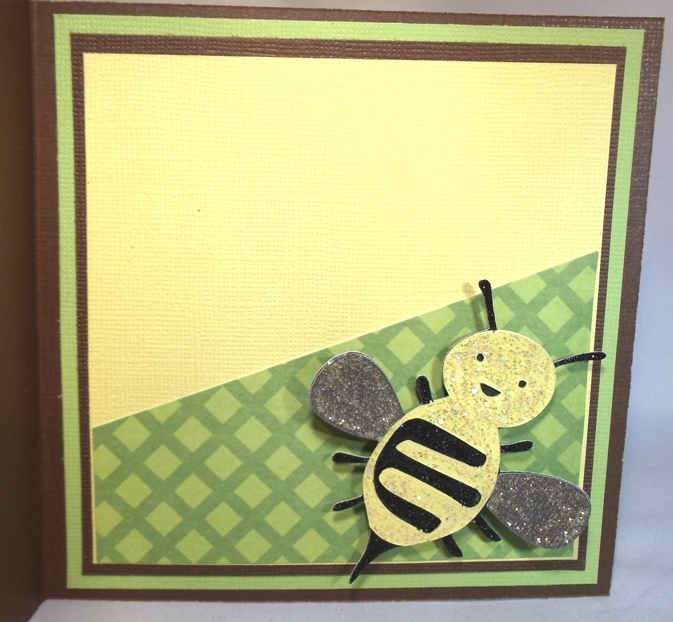 Cute bee card! Bees are amazing. TFS. BEEutiful card! The inside is just as cute as the front! Terrific job! HAD to become a follower! Thanks for sharing your talent! Love your cute card and the saying on the front. The decoration on the inside is like frosting on the cake. Great card!! LOVE the bee's sparkly wings! Thanks for the bee facts!! Happy Earth Day!! I Love your card & the message. Here in S.NJ, the cranberry/blueberry farmers are feeling the decline of bee population & I have noticed fewer on my land as well. No matter how you look at it, this card is just too cute! Asorable BEE card and yes we can all do our part!! Loved those eyes!! I am already a follower!! I love this. Very fond of bees. great job! I already have your blinkie. I love those the bee. What a buzzing adorable card. I love bees! They give us that wonderful thing called honey! Such a cute idea! We do need to save the bees! Thanks for sharing! OMG cutest cutest card. Love the phrase, too. BEE-utiful card! We love our bees.. I am always so happy to see them in our garden! (My kids aren't always so excited, but I explain to them why we need them!) I am now a follower and look forward to seeing more of your work. My goodness, I never knew the bee population was declining! Great way to bring awareness and wonderful card! TFS! I love the bee card! Love your bee card! I don't really like bees (ok I am afraid of them) but do not want them to become extinct!! I have plenty of flowers in my garden and a butterfly bush too! what a super Bee-autiful card!! heehehe! TFS and Happy birthday Gaby! Your card is BEE-UTIFUL! I am a follower now! Love the card and the blog! I love your bees!!!! which cartridge does she comes from? Love the bee card. It just is so cute - it draws you in! The little bee is soooo cute!! Thank you for sharing! Very cute bee birthday card! Thanks for the blog hop and a chance to win. I just adore the bee! Love your bee card! And I did not know they were so endangered - thanks for the information. Love your card...great idea. Thank you for sharing and chance to win your "candy". Always enjoy your blog. Great card & great message too! Bees are sweet, nice card. Bee-utiful card - with an important message. Poor bees (and other insects). Bee happy about the earth and preserve it! Great card! that bees a pretty lo...we have a decline here in FL too.....i try to be very careful with anything that could harm the bees....and I have lots of wild flowers to keep them happy!!!! I am a new follower. happy to Bee one. Your Bee card is Bee...utiful. Thanks for sharing. Super cute card! Love the bee!! Very cute card. I had no idea of the eminent fate of the bees. Thanks for bringing that to our attention. Those googly eyes really make your card! TFS! What a cute card!! 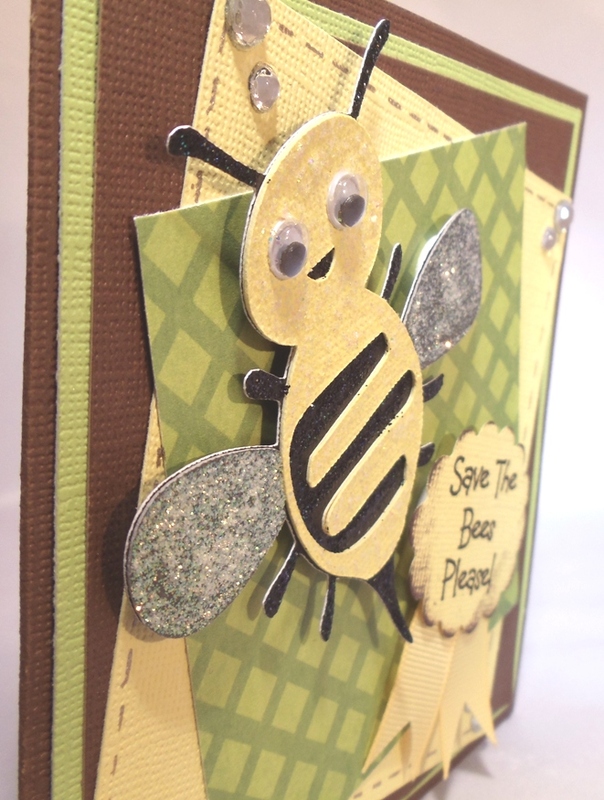 I love the faux stitching and the glitter...your bee is just tooo cute! Hap-Bee Earth day!!! Very cute card!! Thank you for sharing this cute card! Also, thank you for shedding light on the bee crisis. These little bees are so important to our planet! Beautiful card! Love the colors you used!! Love the bling!! Thanks for sharing and thanks for the chance to win! Really cute design. I love anything with bees. Yellow and black are so awesome together! Love this color combo. Thank you for sharing! Very cute card, and with a message, too. TFS! Great card along with some really interesting education! Awesome card!! Thanks for showing it to us!!! great card!! my uncle is a beekeeper so i thought of him when i seen it!! love the pink tools giveaway!! Great card, and thanks for the bee message. I've been following that situation for a couple years, and everyone needs to realize that without these pollinators, there's no food. Great candy, too, and I'm already a follower. Cute card and thanks for the info about the bees. Very cute card. I like the fact you did the inside to. 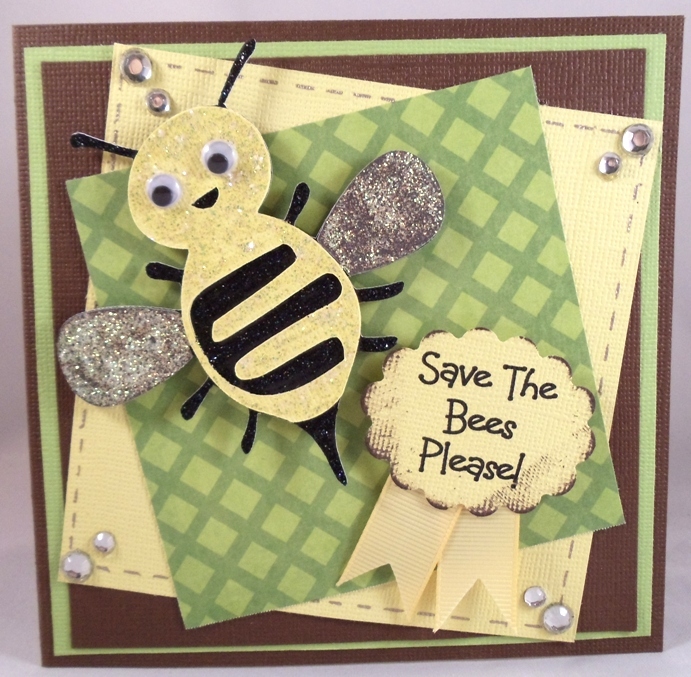 Darling bee card for Earth Day! very cute and very appropriate Earth Day theme.